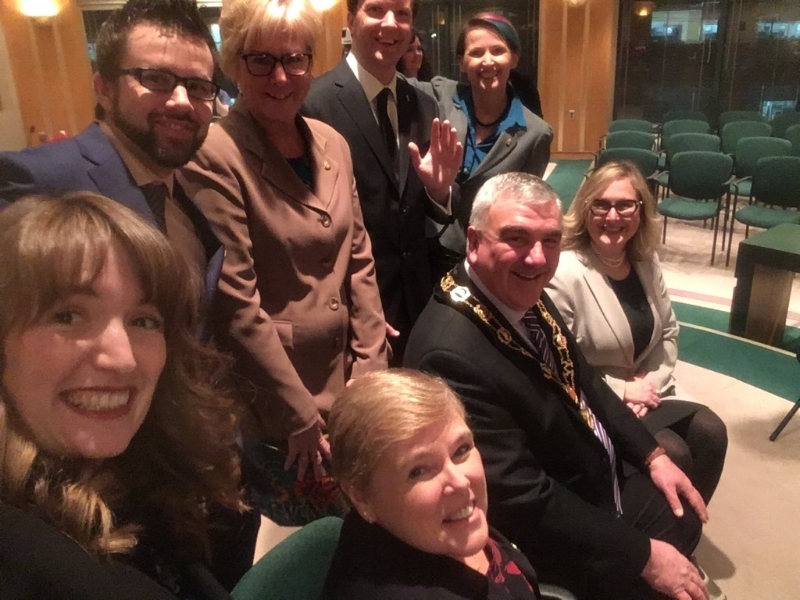 New council selfie taken inauguration night. Last Monday December 5 I was sworn in as a city councillor in Waterloo. You can watch the inauguration here if you want. To my surprise, I was moved to near tears at different points throughout the evening. At first, I was caught off guard by the bagpipes warming up. I don’t have much of a history with bagpipes or bagpipers, but music has the power to make us pause, transporting us away from the every day busyness and inwards into a more reflective state. During the ceremony it was my colleagues thanking those they love and finally my own expression of gratitude towards those who encouraged and supported me that got me most. It was a very special night. Of one of the pictures from the night my partner remarked: “you’re looking genuinely happy.” And I was. I was with those I love and we were celebrating an accomplishment I am humbled to have achieved, as well as a year of hard work and the ups and downs that come with that. As we leave 2018 behind, I am looking ahead to a year of settling in to both my doctoral research and to this new role as a city councillor. The work has already begun and the learning curve is great, including adjusting to this new role as a decision-maker. I’m finding my way, though, and the more I learn, the more effective and helpful I will be. My colleagues on council, experienced and new alike, along with city staff have already been an invaluable resource. Now, let’s get down to business. Two of the first tasks ahead of us are the budget and new strategic plan and we need your input. Budget: During the next term of council I will be part of approving two budgets - a one year-plan for 2019 and a three-year plan for 2020-2022. This year’s budget consultation will focus communication, so that in the second year of budget consultations we’ll be able to reach more people and get different perspectives. Public engagement will happen between December 11, 2018 and February 15, 2019. You can share your thoughts through this survey and please also feel free to contact me at any point if you have questions or want to share your thoughts. Strategic plan: The City of Waterloo is developing a new strategic plan for 2019-2022. The strategic plan identifies the most important priorities for the city and outlines the actions necessary to reach those goals. Complete this short survey up until December 21, 2018. Your input is crucial. A summary report including findings and emerging themes and priorities will be presented to Waterloo City Council on February 25, 2019. Then in March, a second phase of public engagement will take place to encourage the community to contribute to the final draft of the strategic plan.